This individually hand-crafted Confirmation Stone is made of durable glazed pottery which can last a lifetime. At about 1.5 inches, it is sized to fit in a pocket, blessing bowl, or a faith chest. Purchase one of more to gift to others as a meaningful reminder of this milestone. This stone complements the Confirmation Milestone Module. It is also included in the Blessing Bowl set for Congregational Milestones. Confirmation is a vital part of a person's baptismal journey. It is not a graduation, but rather a transition into a new chapter in the faith community. It is important to celebrate this major accomplishment as a significant step in the youth's faith journey. It is an opportunity for the congregational members, parents, and families to share the joy and satisfaction of nurturing faith in these young people. 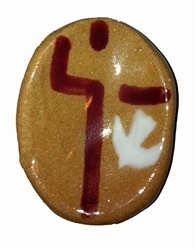 This confirmation stone for gifting is a wonderful keepsake to help the youth remember the accomplishment of taking the next step in their faith journey of confirmation and the special memories that it holds for them.